Your Baxter Springs heating, ventilation and cooling system is a major component that ensures the comfort of your home; however, insulation is just as important of an element that should be taken into consideration. Combating drafts and gaps within your home's exterior walls, insulation in Baxter Springs, Kansas creates a building envelope that can keep the flow of air into and out of your home regulated. Proper insulation allows year-round comfort, keeping the heat in during the colder months and the cool air in during the summer months! Barone's Heat & Air, LLC has been providing insulation services in Baxter Springs to local residents for over 10 years and has the expertise and knowledge to evaluate, install, repair and enhance your Baxter Springs insulation to keep you comfortable while controlling your home energy costs. Call (417) 232-0017 for a free consultation to see how Barone's Heat & Air, LLC's HVAC experts can help you today! Know You Need Insulation in Baxter Springs? Your home should be well insulated for a number of reasons; to regulate and maintain the temperature within your home regardless of what season it is, and to prevent the unwanted escape or entry of air out of or into your home. Ultimately, proper insulation will reduce your energy costs while you are able to enjoy peace of mind and comfort in your insulated Baxter Springs home. 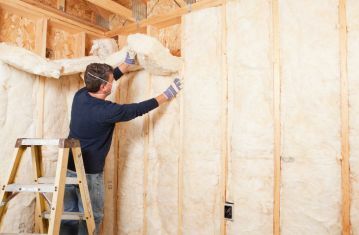 Barone's Heat & Air, LLC's insulation experts advise you to be cognizant of the following warning signs which can require professional repair or installation of insulation in Baxter Springs. If you are experiencing any of the issues listed above, or others that you suspect may be a result of an insulation problem, Barone's Heat & Air, LLC has the experience to locate and solve the source of your compromised Baxter Springs insulation. Our services are simple solutions to fix your problem and have your home comfortable and your energy costs affordable. Call the HVAC pros at (417) 232-0017. Whether a new build home or an existing home with the need for an update, Barone's Heat & Air, LLC offers a multitude of insulation solutions and materials. We use both blown-in cellulose and blown-in fiberglass insulation depending on the needs of your Baxter Springs home's insulation. Efficiency is key at Barone's Heat & Air, LLC, and we have perfected the installation process to ensure speedy and professional service to you!